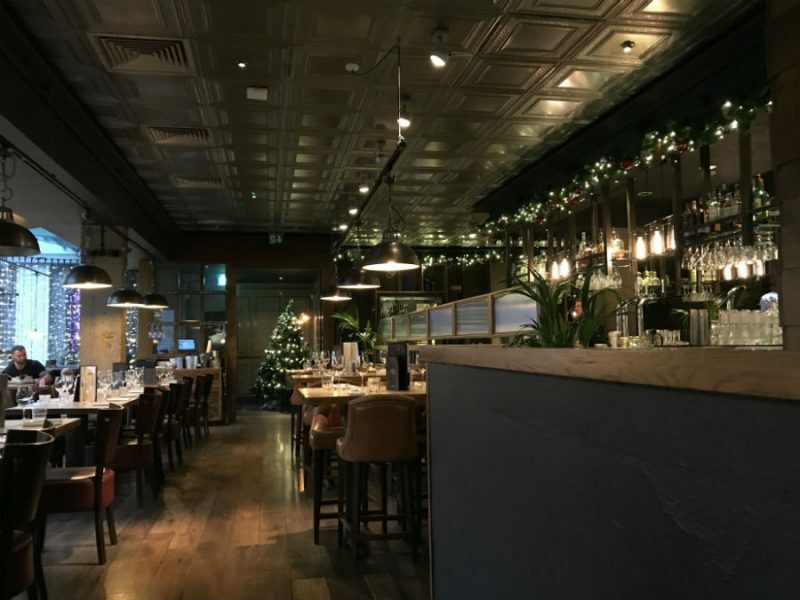 I was slightly wary about doing my Let’s Do Lunch article this week as I’d been to Blackhouse, or Grill on the Square as it is also known, a couple of months ago, when I was asked to cover its tenth birthday bash. As you will know, I do these articles incognito so was a bit nervous about being recognised. I needn’t have bothered as I must have made such a great impression that no one had any idea who I was, other than my name in the diary. Blackhouse photographs by Stan Graham. On my last visit I noticed that they do a lunch menu for £10 so I had come to give it a go. 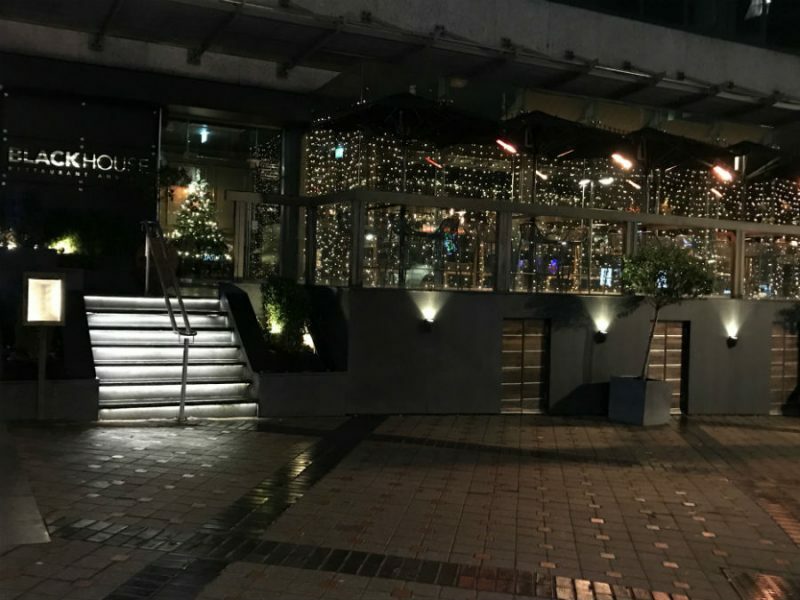 The Lunch Hour, as it is known, runs from noon until 4.00pm, which was great as I had an appointment in the evening so I thought I would get there towards the end of the ‘hour’, I arrived at 3.30 when the place was almost empty and was shown to my table by the receptionist. This was like old times as I used to meet my friends in the bar here for a Friday afternoon post work tincture, or several, but that was years ago. A very pleasant young man arrived with a litre of tap water and the menus. The Lunch Hour selection comprises one course, so it didn’t take me long to choose. 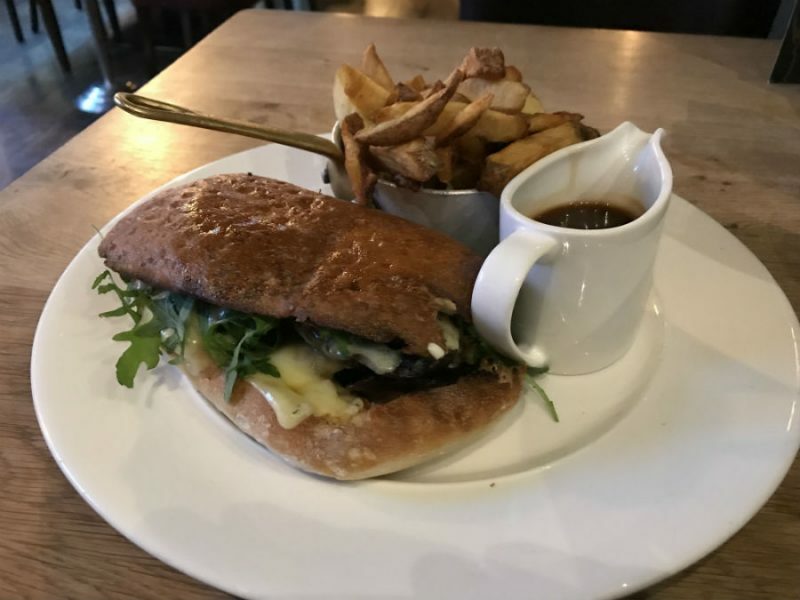 The restaurant prides itself on its meat dishes so I went for the Steak Sandwich which was described as Fillet Steak, Onion, Mushroom, Burnt Onion Mayonnaise, Horseradish Cream and Mature Cheddar. From the wine list I opted for a Romanian Pinot Noir at £8.40 for 250ml. Fortunately, it was a very good example – fruity but with the herby hints one would expect. This was a relief as ordering a glass of red liquid from Transylvania could have turned out badly wrong. The sandwich arrived, accompanied by a jug of gravy and a small saucepan filled with chips. The bread with which the sandwich was made had been toasted a little too long and the top half especially was overly crisp. In addition to the ingredients listed on the menu was a generous helping of rocket which was a welcome lighter element. The chips were very well cooked; crispy on the outside and fluffy in the middle, and the gravy was also just so. Sadly, the only part of the sandwich which was a disappointment was the steak itself. It was billed as being fillet but had the taste and texture more like flank. I have been singing the praises of flank and tri tip steak of late so I would’ve been happy if that had been what was in the sandwich but it was billed as fillet. Whatever the cut, it was overdone and too chewy and sinewy. There was also an aftertaste of liver, which seemed odd. The mushrooms were well done and very flavoursome, as were the dressings, the overall combination of tastes being excellent. Because of the portion size I decided to decline the dessert menu and just have a coffee, but there had been a change of waiting staff since I arrived and the new waitress seemed to be having a more interesting time holding a conversation with a colleague at the other end of the room rather than acknowledging my gesticulations for service. Eventually, she arrived and I ordered my Americano (£2.50) which was delivered shortly thereafter. It was just on the strong side of normal which is how I like it so all was well there. I then went through the motions of trying to attract the waitress’ attention for the bill, with the same result as before. There were only two other customers in the place and whilst I don’t expect constant eye contact from the staff, a glance in our direction every now and then would not have gone astray. I decided to pay my bill to the receptionist on the way out and so I asked her if the steak in the sandwich was really fillet, to which she replied, ‘It’s supposed to be!’ I proffered my credit card and left. It is such a shame about some of the service, and the steak and over toasted bun, as the taste combination was wonderful, as was the presentation. The portion size was also good and should have achieved ten out of ten but I walked out into the dark Leeds evening feeling very let down.